Now you have an overview of all your event registrations, you got via email. At a glance you can see how many people registered. With one click on the Event you get the overview of all registrations for this event in detail. By clicking the buy button, you agree to acquire a temporary and revocable license applicable to one WordPress instance and a single user. Purchase now and save €15! 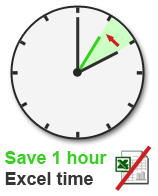 We are sure you will save at least 1 hour of your precious office time every month! No need for annoying Excel lists! Finally, the annoying copy and past of the registration to an extra Excel list is history. Manage all registrations simple, always up to date and in the cloud with your team. We are sure that you save at least 1 hour of your time every month with our PRO–Plugin, you would otherwise need to manage the participants lists in Excel. Installation: It is very easy to set up, just upload the plugin ZIP-file as every other WordPress plugin, activate and you will see the incoming registrations for all your events. WordPress requirements: ‘The Events Calendar‘ plugin and our free WordPress plugin: The Events Calendar Extension: Registration is already installed and activated. Available languages: English, German, Spanish, French and Russian (more to come). Terms and Conditions: By clicking “buy button”, you agree to acquire a temporary and revocable license applicable to one WordPress instance and a single user. Of course, you can cancel the monthly subscription at any time. If you cancel your subscription your are not allowed the use the PRO plugin furthermore. You want more PRO features?! Stay tuned! Sign in for the newsletter. Use our contact form and leave us your email and phone number, so we can call you or answer your questions via email.